Note: This material is from a 1994(!) Talk about CCDs - the physics remains the same, only the detector size has increased since then. Transfer Charge --> Apply a differential voltage across gates. 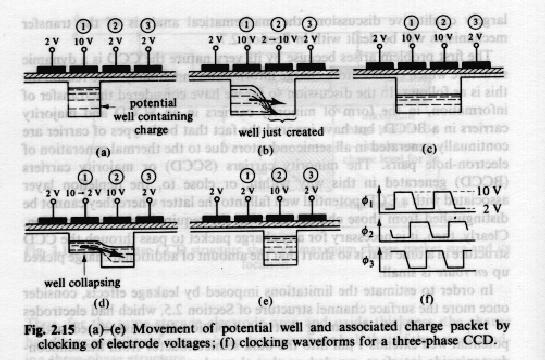 Signal electrons move down vertical registers (columns) to horizontal register. Each line is serially read out by an on-chip amplifier. Detect Charge --> individual charge packets are converted to an output voltage and then digitally encoded. Metal Insulator Capacitor (MIS) . 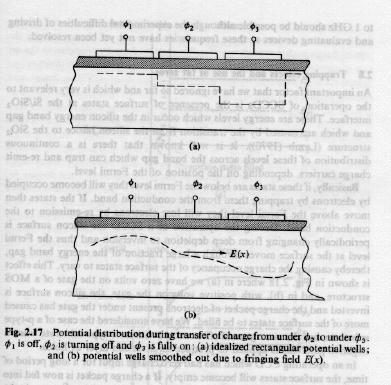 Application of Positive voltage means that majority carriers (holes) are repelled in region underneath the oxide layer --> this forms a potential well for electrons. Initial design used surface channels --> but charge can become trapped by fast surface states As a result CTE is 98% which is horrible. 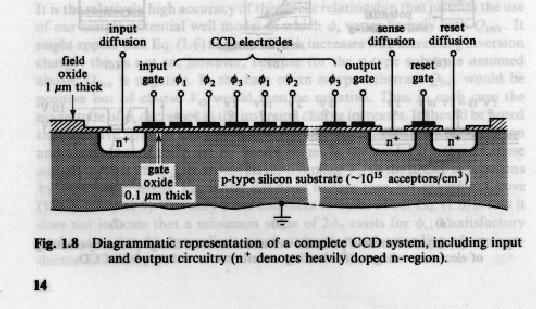 To circumvent the surface state trapping problem requires a buried channel CCD (electrodes buried into the bulk). CTE's of up to 99.999% can be achieved in this manner. n-dopant reshapes the potential well and forces electrons to collect below the oxide interface. Main limitation is number of gate shorts or opens. These defects are usually caused by contamination. Minimum clean room level is 100. 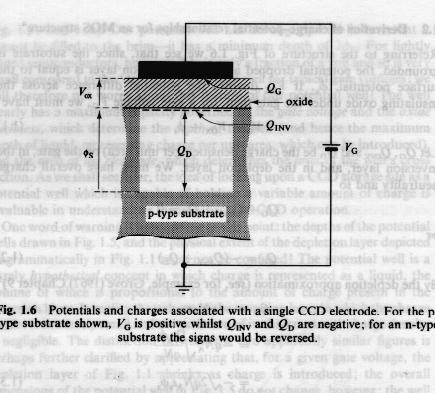 Doped poly silicon is much less conductive than aluminum --> interelectrode shorts are no longer catastrophic. 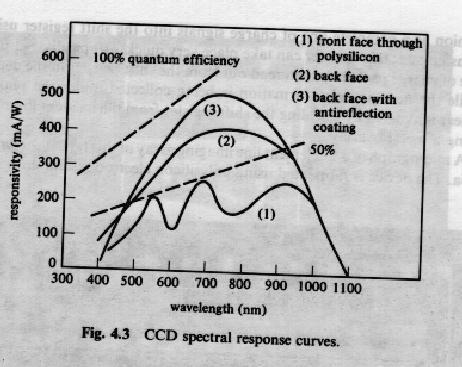 Also poly silicon is transparent to incoming photons allowing for frontside illumination. Aluminum is opaque which requires thinning and backside illumination . --> LOCOS significantly reduces substrate shorts. Pixels are laid down via photolithography --> precise positioning of doped regions and interconnections. 3-phase pixels with sizes of 5 microns can now be made. Limited by absorption of blue photons by relatively thick (5000 A) poly-silicate gates. Absorption depth for 4000 A photon is only 2000 A. Also, surface reflectivity increases with decreasing wavelength. Hence thick frontside illuminated devices have good QE only in the red. After thinning the silicon oxides forming a native oxide layer about 20 A in thickness which, through a process too complex to be understood by astronomers, causes the surface to become positively charged. UV flooding --> creates lots of free electrons. Some of these electrons have enough energy to escape to the back surface thus creating a small surface voltage which in turn attracts and acculumates a thin layer of holes; hole gradient sets up an intense electric field in the silicon (100,000 V/cm). But, doesn't last unless the detector stays at -95 C (or lower). Converts incoming UV photons to longer wavelength photons. Can evaporate under conditions of high vacuum. Design Traps --> narrowing of signal channel which produces a potential barrier in which charge can be trapped. Usually happens at transfer gate between array and the horizontal register as transfer gates are tapered in order to properly transfer charge to the horizontal register. Hence a trap (potential barrier) is created at the front of the gate. This is most noticeable when low-level point sources are imaged. As the packet passes through the transfer gate, the charge is redistributed into a "tail" of trailing pixels. This is fatal for HST detectors. Problem is temporarily solved by a fat-zero which fills the trapping regions thus allowing signal charge to pass through unimpeded. But this increases the read noise of the detector. Note, about 50,000 HST CCDs were fabricated and tested before this problem was noticed and characterized. Now CCDS are designed so that the signal carrying channel is constricted at the end of beginning of the transfer gate as opposed to mid-phase. Process Induced Traps --> Localized Defects which are usually randomly distributed. Okay if the defect is in a vertical column but is fatal if its in the horizontal register. This traditionally has been a main cause of low sensor yield. Bulk Traps --> lattice defects or deep-level metallic impurities in the substrate. If these traps lie in the charge transfer channel then trapping occurs. Ultimately, CTE is bulk state limited. Bulk traps usually become active at low operating temperature when emission time constant of the trap is equal to the charge transfer time from one phase to the next. So, speed up this time either by operating at higher temperature or adjusting clockrates. Radiation Induced Traps: Energetic particles displace silicon atoms from the lattice structure. These then act like bulk traps. This is mostly a problem for space based CCDs. Use Fe-55 which produces a 5.9 Kev photon. When this interacts with the CCD, 1620 electrons are generated in a volume much smaller than a pixel. Then see if 1620 electrons come out of your amplifier. For a 2048x2048 and a CTE of .999999, 41 electrons will be lost and this, in fact, can be measured now! On-chip Amplifier Noise: combination of thermal white noise, 1/f noise and sense node sensitivity. After a decade of experimentation, optimal design was reached and typical readout noise is now 4-5 electrons (full well capacity is at least 100,000 electrons these days). Note that if 1/f noise were not present, white noise could go to zero just by increasing the electrical bandwidth of the CCD signal processor and increasing the sampling period for each pixel. Still the current world record is 1.5 electrons rms ! 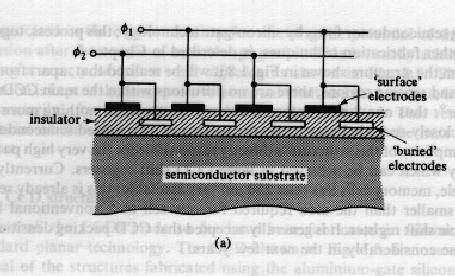 Thermal generation of electrons by the finite temperature of the device. Electron thermal hopping from the valence band to an interface state and then the conduction band produces an e-h pair that collects in the potential well. This can be minimized by the presence of free carriers that will fill the interface states and inhibit hopping. Multi-pinned phase (MPP) CCDs take advantage of this. To have well capacity while inverted requires the potential of one of the phases to be offset from the others. This can be done by doping with boron beneath phase 3, which now acts as a barrier phase as it will attain inversion before phases 1 and 2. In practice, total inversion occurs at -6.5 V for phase 3 and -8V for phases 1 and 2. 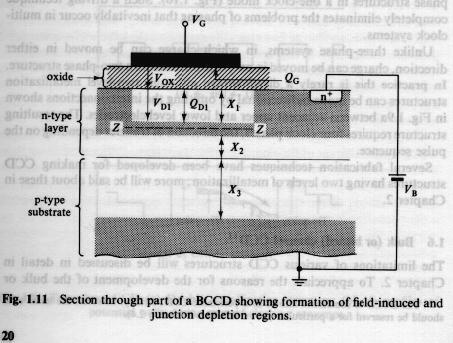 The 2.5 V offset is determined by the amount of boron which is implanted. Result of MPP is to eliminate surface dark current and therefore achieve low dark count at temperatures well above 77K (also helps eliminate condensation on dewar window). MPP devices can operate at room temperature now for 8 minutes before the dark current fills the well!